Pápai Páriz Ferenc, Album amicorum p. 95. Londini die 8.vo Julij 1721. For another version of the same motto cf. the note of Tobias Stranover on p. 91. With this trifle I want to recommend myself to the good memory of the possessor of this Album. In London, July 8, 1721.
p. 95. London, July 8, 1721. The matricules of the Leiden University include the following register dated on December 30, 1719: Michael Bauer, Burgaviensis, 24, Juris studiosus. That is, he was from Burgau of Bavaria (former Schwaben-Neuburg), and he was 24 years old when he immatriculated as a student of law. Thus he might have born around 1695. 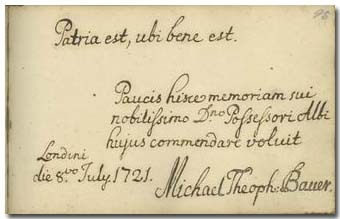 He made his note in the Album of Ferenc Páriz Pápai on July 8, 1721 in London. Tobias Stranover, who made his note two pages back (p. 91), used another version of the same Ciceronian motto: Where you are well off, there is your fatherland.